We made into our new place this morning, but unfortunately our Schtuff hasn't made it here it yet. Our Schtuff includes an air mattress & sheets, my Wolfgang Puck stainless steel pots and pans that I've had longer than my children and are worth every bit of the $350 we spent to send all our Schtuff on a slooow boat. (It would have been DOUBLE for first class, and we thought we'd take a little longer getting here.) There's also a small set of dishes and the kids' rollerblades along with sleeping bags. Other than that I have no clue what's on it's way. Oh, wetsuits and a robotic dinosaur. Don't think Jewel didn't have to give her dad big puppy dog eyes to get him to ship that big beast, either. But, all I really want is that $20 blow up mattress. At least I'm only slightly red, not sunburned, after mine and Jonas' swim in the bay looking for sea turtles. After playing on the beach a while we hit up a big permanent yard sale place and got some boogie boards and beach chairs, which are currently filling in for our non existent couch. The highlight of the day was Bar B Que Kai take-out. We first discovered this little dive in Waianae about seven years ago and it quickly became our favorite eating joint in the world. It was great to see that nothing's changed..... the teriyaki beef plate was just as good as the first time. My kitchen box can get lost at sea as long as I have BarB Que Kai. When we left the mainland two days ago we had nothing waiting for us on the island. No car. No hotel. We figured all that would just fall into place as so many things for us tend to do. I planned on finding us a hotel while Joey was gathering our baggage, but I was having a hard time choosing a place online because I didn't know what we'd really be getting, nor how close it actually was to the beach. When an airport shuttle employee asked me if we needed a shuttle to our hotel I told him we didn't have one but we'd like one in Waikiki, within close walking distance to the beach and he recommended the Ohana East Hotel, which turned out to be a very good choice, grand but reasonably priced. We booked two days thinking we'd be moving into one of the two condos we had found online. We landed before noon so immediately after the bellboy "shaka bra'd" us we put on our suits and headed straight to the beach. We were totally relaxed without a care in the world when I find out our condos are gone! Immediately now I'm stressing, then the kids start bickering. We spent the late afternoon internet searching for another condo, only these we'll have to see first but we don't have a car yet to even go check them out. So we start looking on Craigslist for a car when he found a great deal on a minivan and unlike all the others this one happened to only be about a thirty minute walk away, so walked along the beach parks East past the Zoo and the Aquarium and all the homeless people in tents. When we get to the van we immediately like it and I'm already thinking "well...worse case, it can double as a condo". Too late to get cash so we just sign the sale agreement and walk back to the hotel, and get caught in a rainstorm. Of course. The next morning, yesterday, we go looking for our bank and after locating one on my phone we catch the trolley there (which is free with our hotel key). After getting off the trolley at the Ala Moana center we wandered around but couldn't find it so I call them and they say they're not a bank, just a mortgage center! We try a local savings bank and the girl was pretty rude and didn't want to help us get any cash, which was difficult because of all the security measures, but still! We went across the street to Bank of Hawaii and had a very pleasant teller without any attitude....and finally got the money to go pick up our van. What we expected to take about thirty minutes ending up taking up half our day, and we had to meet the guy in only an hour after finally getting back to Waikiki so our plans of renting boards for the day were shot. To make it worse there was a Bank of Hawaii right across the street from our hotel. While everyone else rested in the hotel Jake and I walked down to get the van, and even though we had an appointment, the guy wasn't home. We waited in his backyard, aka sandy beach, for him until he showed up and then before I even leave Joey calls and says he found us a condo in the area we wanted and now instead of going to the beach we have to drive all the way out to Makaha to see it and beat the other person there that is interested. They'll be waiting out front of the hotel for me.....only I couldn't take the same way back to the hotel that I walked because of one way streets and the whole time I was wanting to go left but I could always only ever go right. Then when I could take a left, it was closed for construction. I'm in busy Honolulu, trying to get across a canal that only has one bridge across it and Joey keeps calling me asking me where I am. And now my fuel light comes on. Great. I finally get to the hotel....and promptly pass it. Finally we make it, pick up all my pretty people and drive as fast as we can on the bumper to bumper H1 freeway. Honolulu is just a mini L.A., really. We beat the other couple to the condo and pass them on our way out, but the realtor already told us she liked us and we had the condo so she was just going to show them it out of respect. Whew! So on our second day in Paradise feeling like everything is going against us, things finally start looking up. We have a PAID OFF car and got a condo for a quarter of the price than we had planned on. The Universe just made us work for it a little harder, which I can respect. I already appreciate it even more. We may not have touched a board yet, but we have plenty of time. We're moving into the condo today and with any luck our stuff is waiting for us at the Post Office. The roads in and out of Flagstaff were closed for a couple days because of the great Arizona Snowstorm of 2010, so we ended up staying in Tuba City another night. Of course we were all eager to get on the road but unless we went hundreds of miles out of our way, we had no choice. This is the first time I can remember staying in an RV park on an Indian Reservation, and we were delightfully surprised. Normally we just drive through only stopping for gas where we almost always get approached by locals asking for change, and always because they're stranded from home and need gas money to get back. We've been hearing that request for fifteen years and I'm starting to think they're pulling my leg. None of that this time, though! This time we ate at Hogan's Restaurant and enjoyed authentic Indian Fry Bread. The restaurant was cozy, but our waiter was pretty obvious that he preferred the locals over us whitey's. We headed out just before noon and right after they opened the roads, and it was smooth sailing all the way past Flagstaff..... And what a sight Flagstaff was! Snow was as high as the fences and the drifts were almost covering homes. We'd seen on Twitter that roofs were collapsing, completely demolishing buildings and the whole town had been shut down. When we went through we didn't see any devastation just beautiful untouched white landscape. We spent a couple days with Joey's brother Bryan and his girlfriend in Glendale, AZ and had every intention of seeing everyone else and visiting a couple of my girlfriends but after we thawed out we found next day tickets to Hawaii for only $150 each, we booked them, then got ourselves a ride and spent last night reducing our world into seven carry-on's and five check-in's. Of which the check in's cost more than another plane ticket would have....BUT, we are finally in Hawaii! 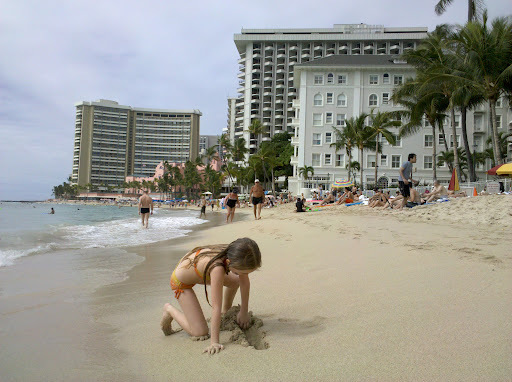 We grabbed a shuttle into Waikiki and checked into a pretty nice hotel within walking distance of famous Waikiki Beach, and after checking on surf lessons for the entire family we agreed we don't need no stinking surf school..we're unschoolers! So over the next few days in between looking for a new place to live and finding a car to buy, we hope to bring out our inner Duke and Gidget. Aloha! What an insane drive down to Arizona this has been, and it's not even over yet. We left Moab yesterday morning in a blizzard, woke up this morning in Blanding, about 20 miles away, in another blizzard. During that time there were things like radiator hose leaks, tractor pulling something large and green out of the snow, furnace only blowing cold for all 50 hrs in BLIZZARDS, and calling the police on crazy man from India. We tried to pull into the RV park in Blanding, UT last night but after aformentioned tractor/green/snow incident we didn't want to chance their snowpacked lanes so we asked the Super 8 next door, with the big open empty parking lot, if we could plug into their electricity for the night. After agreeing on $20 he let us park and we told him we'd be out by 7 or 8. He tries hanging around and talking with us telling us how he needs us to help him and give him more money. Tries to get us to then buy a room but I stand firm and say we just want the electric plug. He finally relents and leaves us alone. Then this morning at 7:30 he bangs real loud on the outside of our bus and then runs and hides behind the glass door inside the hotel. So we get dressed, and fire up the bus and when Joey gets outside to go unplug he is out there trying to get another 5$ because we stayed too long and are driving their bill up! Joey's like no, man, we're leaving and then this "security guy" runs over and grabs our cord and yanks it out bending the tongs. He then starts cussing saying "I go call my boss!" Joey's first reaction was to grab him by the throat and pin him down for a minute, but he just snatched the cord back and put it up, all while this guy is yelling and screaming, and all we can make out is "more money' and "help him". We got out of there as fast as our air brakes would pump up and thanked him very much on our way past him. Let's not forget this is happening in a blizzard. We try to drive out of town but there's no way we're risking it, so pull into the first place that doesn't look like we'll get stuck which just happened to be under a car wash. That our A/C barely made it under. The owner saw us pull in and came over and offered to plug us in and told us he had hot fresh coffee in his laundrymat next door. He refused Joey's money and told us we could stay as long as we needed. Now how crazy is that?? Not two minutes after fleeing a crazy foreigner demanding we give him more money for something after the fact, to a local man offering up help to stranded travelers with absolutely no benefit for himself. These things can't help but affect us and our children got to witness this all. Of course, it led to discussions all over the map...race, karma, religion, war, assault, prison, compassion, customs, appreciation and relationships. When we talked to the local police about the incident we were not surprised to hear they knew exactly who we were talking about before we even stopped talking. 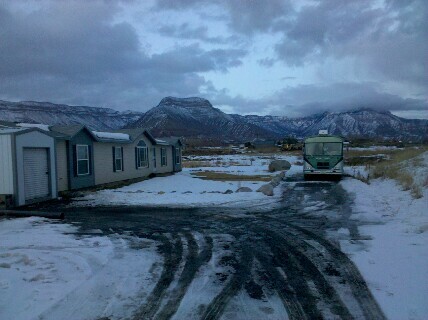 It's amazing the Super 8 in Blanding, UT has any business at all, which according to the parking lot wasn't much anyway. We ended up staying under the car wash until around 3 when they finally called the roads good. The roads were decent, some hairy parts but nothing bad, but man was it cold!! In order to help keep our toes from getting frostbit I cooked a pizza, then baked some brownies. It did the trick. We've always known our kids were good travelers but this trip they've proven themselves to be Rock Star Travelers. These guys never complained, and have just taken it all in stride, even laughing with us at the absurdity of it all. Reminds me of the time the kids and I were in a shared hotel room with another mom and her two kids, when the fire alarm went off in the middle of the night. After going out into the hall and determining it was indeed an emergency and we needed to evacuate I was able to get my six and eight year olds up and out of bed while I carried my four year old........in about fifteen seconds! On our way out the door I yelled good-bye to my sleeping roommates. We then stood outside shivering in the cold while my boys were barefoot and they did not complain, cry, whine, nothing...not once, while there were other kids crying while they each had a parent holding them wrapped up in comforters. I don't know what it is about these kids of ours, but I sure could take some lessons from them. We left tuesday late afternoon for a quick 670 mile one nighter drive.....and here we sit two nights later and we've barely made it half way. We could have risked it and probably made it but we're playing it safe these days........not letting anything ruin our dream of getting to Hawaii! Tonight Tuba City, AZ and hopefully tomorrow Flagstaff is good enough that we can make it to Phoenix. Probably not too much of a surprise, but things have changed a little since we last talked. We're no longer buying the new black bus we talked about and have moved back in to the green bus. On Sunday night we got to questioning our plans again, and came to the conclusion that what we REALLY want to do is move to Hawaii. We're about traveled out of the States and we can't afford International travel yet, plus we want to give the kids a chance to grow up somewhere and make friends that they can play with for more than a week, so by Tuesday we had ten boxes shipped to Hawaii, four boxes shipped off to storage in Texas, thirty five bags to the Goodwill, the truck stored at a friend's house, a 2200sf house cleaned spotless, cried good-bye to four cats, loaded up the bus, and were back on the road to Phoenix where we'll visit family & friends for a few days before we leave for our new journey. We never expected to be moving back into the bus and quite frankly I was expecting some complaining, especially from the always outspoken-not afraid to speak his mind-Jonas, so was surprised upon moving in for Jonas to say, "It feels good to be back in the bus!" I was like, "yeah???". But of course he then followed it up with, "but it feels even better to be moving to Hawaii!" We had a lot of great times in the bus as well. Some not so great ones too... LOL. We were told that the bus was originally a school bus in the City of Mission, BC, which was really neat because that's where we lived when we first got married. A man from the Vancouver area started the conversion and then passed away before it was finished. A family from Mission purchased the bus and finished converting it. We were newlyweds and I was an Associate Pastor in a small church in Mission and my wife and I wanted to find a large motorhome to live in and to use to take groups on missions trips. After looking at hundreds of motorhomes (and dragging my new bride all over the place to many RV lots) we found the bus. We moved in and did a few renos to make it more useable for ourselves. We took the bunkbeds out and put in the closet. We also put on the awning, replaced the existing driver's seat with one of the two teal chairs (that had been where the couch is now), and put the couch in. We started taking groups to Mexico twice a year to work in orphanages, build churches, run children's camps, etc. I think we took close to 100 people down over the 5 years that we lived in it. We also did lots of traveling on our own time. Most of our personal travels were in BC, Alberta, and Saskatchewan. A few years into living in the bus, my wife flooded the back half by overfilling the bathroom sink. That was when we decided to put in the laminate flooring, enlargen the bathroom, (it used to be half as big with a sliding pocket door closing off the hallway,) recover the doghouse, and remove the old style dinette which had matching teal cushions. Everywhere we went people asked us about the bus. Usually we were asked if it was our parent's unit since we were so young. We were 21 years old when we moved in. I should tell you the story about when we put in the rebuilt 3208 Cat motor. The original Cummins Diesel was tiring out and we wanted to continue the long trips to Mexico. We purchased a rebuilt Cat motor and a friend and I installed it over a month. Finally, we were to take the maiden voyage and headed out down the road. After about 2km I heard a loud "swoosh" and wondered what had happened. Another km or two down the road the bus shut off and we smelled a burned smell. As it turned out, the manufacturer had put in the incorrect oil gasket and the oil leaked out all over the road which fried our new and long awaited motor! We got it hauled back to their shop and they installed a new rebuilt Cat within a week. I read in your blog that you had a line break or freeze... we only ever had one line freeze and it was between the shower and the wall. Once I finally figured that out I just put a hair dryer back there (underneath the sink) and it thawed it out within minutes. Shortly after that we moved to Kelowna in the Okanagan and purchased a townhouse. We have a four and a half year old son and a five month old boy as well. We wanted to start camping with our kids and a year ago we purchased a camper van made by Pleasureway. It's a pop top van and is a lot better than sleeping on the ground... we could never go to tenting after living in the bus for 5 years. One day we hope to have a bus again but for now my oldest son and I enjoy looking at pictures of buses on the internet. That was how we came across our old bus. We always wondered what happened to it and we are excited to see another family enjoying it. Have you sold it? Where is it now? Are you living in a new bus? Thanks for responding to our email. It sort of brought some closure for us to see where the bus had gone. We’re getting ready now to make our final trip in the old bus so it was great to finally put all the pieces together and with a bit of luck, any future Green Turd owners will find this and we’ll all learn it’s future. It’s been a good bus, and I hope will make just as many memorable adventures for the next family!